Telephone: +353 (0)26 40222 (factory). Lars Edman, owner (back row, middle of photo with striped shirt), recalls the early days of Prince August in Kilnamartyra Village, near Macroom town, County Cork, P12 FN79, Ireland. In early January 1976 my newlywed wife and I came to Ireland from Sweden. 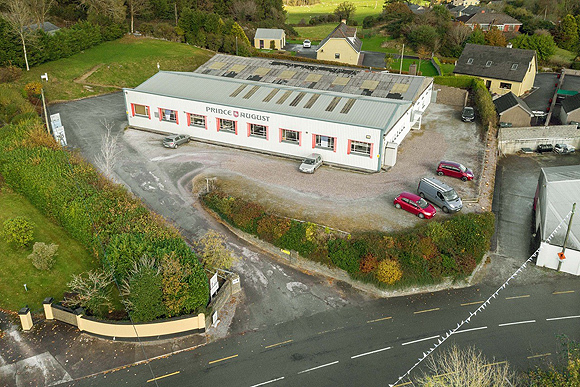 We had bought a factory building in the small village of Kilnamartyra in late 1975 and now it was to time to get started. After a few days of recruiting a couple of local people we started the factory on the 8th of January. We had brought 2 mould making machines from Sweden and the first thing we did, was installing them. It did not take long and after a week production of moulds started. Our first employees were Joe McCarthy and Tony Nott. I particularly remember Tony as he came into the factory, said nothing but hello, grabbed a hammer and started to work. We had no interview and formal agreement. He just floated in and became an employee. Both of them have left us but the next employee is still with us, Dan Golden. The facilities at the factory were very basic at the start. We had no heating but we were kept warm by mould making machines. At the breaks everybody was gathering in the only office in the building. It gave us a good chance to get to know the local people and practice the local accent. The telephone system was the thing which amazed us most. There was a handle on the phone which had to be turned fast to get the attention of an operator. It sometime took a while to get a reply from the local operator but then she had to transfer the call to an operator in Macroom and that could take an eternity. It drove us absolutely crazy. After growing up in a country where we took automatic telephones for granted it was very frustrating to get used to the old system. It took until 1984 before our phones went automatic. 'Prince August', 'Mithril Miniatures', 'the Edman Collection', 'Toy Soldier Factory' are registered trade names of An Grupa Edman Teo ( The Edman Group Ltd). Registered in Dublin #269484. Directors Lars Edman (swedish), Margaret Edman.